Bar open Mon–Fri noon–midnight; Sat/Sun 10am–1am. Food served Mon–Fri noon–10pm; Sat/Sun 10am–4pm; 5pm–10.30pm. A beautiful historic bar with a sophisticated menu to match. Year on year, Nobles has evolved from decent pub to dining destination and now appears to have hit the sweet spot. 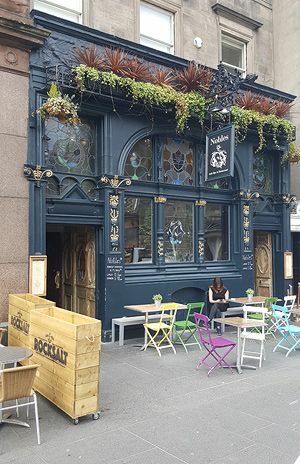 Its elegant Victorian dark panelled walls, stained glass and nautical curiosities celebrate the rich maritime heritage of Leith but there is nothing old-fashioned about the menus. A chestnut mushroom and beetroot pâté comes with a tarragon gel and pickled mushrooms creating a surprising, deeply delicious combination. Shetland mussels are fat and juicy in a properly garlicky white wine broth. Save room if you can for dessert: the salted chocolate délice is rich and dark, and comes with a luscious rose, pistachio and cardamom ice-cream. If you can get a table weekend brunch is well worth a return trip (though locals might prefer if that was kept a secret). With inventive cocktails and curated local beers, Nobles is a true Leith gem.